The long-awaited Final Report on MH17 crash released by the Dutch Safety Board’ International Commission last week has only left a cold scent in the headlines. The reason is hardly the booming Syrian epic. The Dutch report lacked the substance so vigorously expected by all concerned parties: direct indication to the perpetrator. The legally impeccable statement about Ukraine’s failure to comply with its obligation to close the sky over the war-torn area for civilian aircraft was important, but did not answer the key question: who pushed the button? The 279-page report is full of commonplace charts and infographics, but when it comes to principal data and assessments, it exposes a 320 sqr km zone of the “possible launching site” and mispresents the type of BUK missile which hit the Malaysian Boeing (“9M38 and 9M38M1 missiles” while no signs of specific I-beam striking elements of 9M38M1 missile were found on the wrecked parts of fuselage). 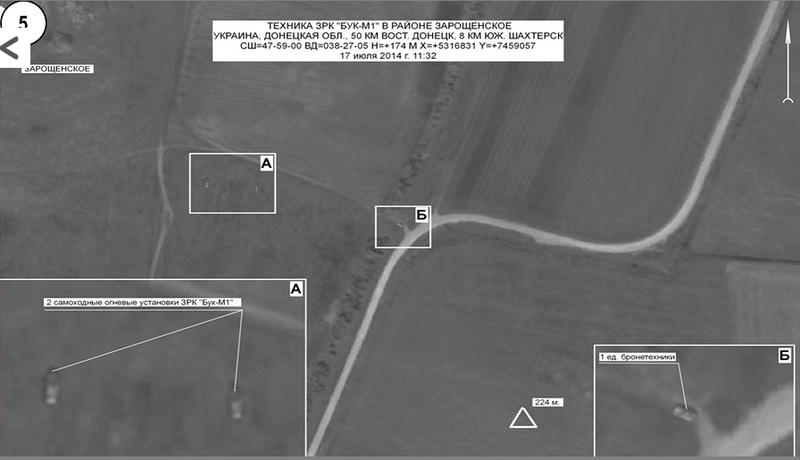 At one point it regretfully slips into the outright forgery when publishing a visualization map (p.146, fig.64) claiming that the marked area was determined by BUK manufacturer (Concern Almaz-Antey) as the most likely launching spot zone (in reality that map from a slide presented during June 2, 2015 press-conference by Almaz-Antey was to illustrate a hypothesis that the missile was launched from Snezhnoe location, subsequently declined by further computation of the manufacturer). As the result of this experiment the hypothesis that the missile came from the Snezhnoe location (under republican’s control) was definitely discarded by the missile producer. 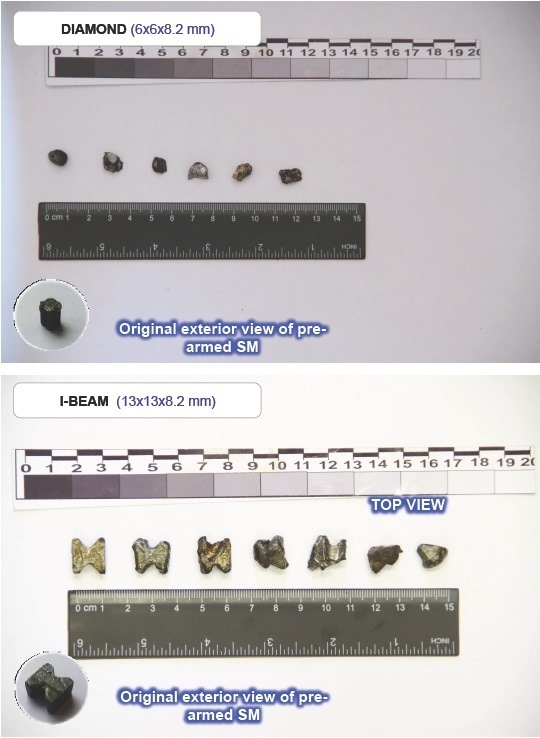 P.74 of Almaz-Antey report demonstrates the difference between striking elements inside 9М38 (diamond type, above) and 9М38М1 (I-beam type, below) BUK missiles. The fact is that there were no holes caused by I-Beam type elements on the fuselage of the Malaysian Boeing. That means that it was downed by 9M38 missile compatible with only the first-generation BUK 9К37 launcher which was produced in Soviet Union in 1978-1986. A large number of BUK complexes were on service in the Ukraine-based Soviet Army Air Defense regiments and were left there after the collapse of Soviet Union. Since 1983 the Soviet (and later Russian army) was receiving the modernized 9K37M1 Buk-M1 modification equipped with 9М38М1 missiles, while the latter is being replaced by a newer modification, 9K37M1-2 Buk-M1-2 (missile code 9M317) since 1998. As a matter of fact by 2011, the ultimate life limit for the last 9M38 missiles produced in 1986, there were no BUKs of that type on active service in the Russian Army. Meanwhile according to documented data, in 2005 there were 502 units of 9M38 missiles still serving in Ukraine(inspection report in disposal of Concern Almaz-Antey). The main task of any international commission to investigate the air accident of this nature should be scrutinising the Ukrainian munition stock records of the Air Defense units for the last 10 years. Russian satellite image of the area ‎47° 59’N, ‎38° 27′ 05”E taken at 11.32AM (msk) 17.07.2014. Two Ukrainian BUKs seen in the sector A. Photo courtesy of the Russian Defense Ministry. 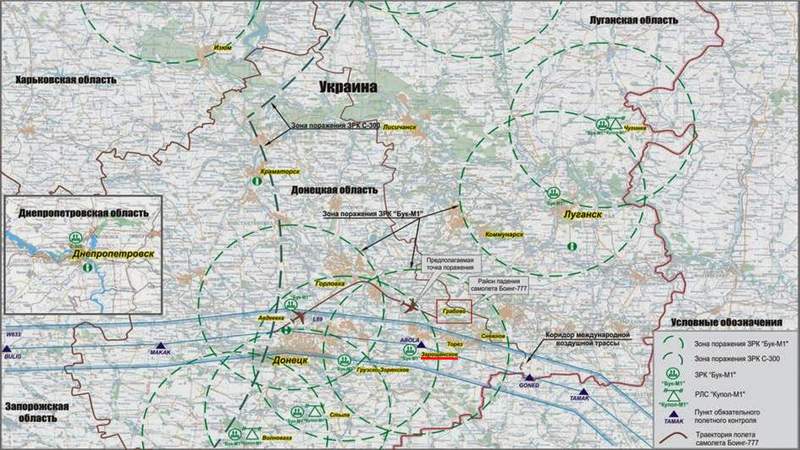 Ukrainian Army BUKs locations map, July 2014. Zaroshchenskoe underlined in red. Accomplished forensic research suggests that the fragments of fuselage of Boeing 777-200 board number 9M-MRD which collapsed during flight MH17 from Amsterdam to Kuala Lumpur on July 17, 2014, have damages caused by the combat weapons. The locations of holes and other damages indicate that the aircraft was hit in the air by a weapon equipped with high-explosive fragmentation warhead with ready strike elements. The explosion took place at the distance 0.8-1.6 m outside the glass cover of the pilot’s cabin. The warhead weight did not exceed 40 kg. It contained 2000-4000 individual fragments (submunitions) in form of rectangular blocks with physical dimensions 8x8x6 mm, around 3 g each. The targetting was carried out by either radiolocation or thermovision devices of the warhead. According to available data, the specific weapon used to attack Boeing 777-200 cannot be determined univocally, but the most probable option basing on the parametres of the warhead, is the Israel-made Python air-to-air missile. While analysing air-to-air version of the MH17 tragedy is beyond the line of this article, it should be noted that 4th and 5th generation of the Python missile was adapted for SU-25 “Scorpion” fighter and exported to several post-Soviet states in early 2000s. More details on Albert’s report can be found here. Considering the exposed facts it is at least surprising that the Dutch report does not contain a scrupulous review of all warheads produced worldwide with similar striking elements inside. 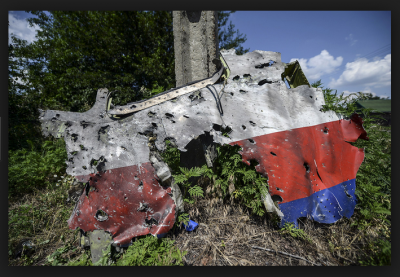 Evidently, the main issue – who is the criminal perpetrator – is still unsolved 15 months after MH17 shootdown as it was at the very first day. The quality and professionalism of the costly clandestine investigation carried out by the Dutch Safety Board is now questioned not only by Russian and international observers, but the members of the International Commission itself. After the prejudiced allegations about “Russia protecting the guilty” made by DSB chief Tjibbe Joustra last Friday, we can’t bear more illusions about impartiality of this Commission (if they ever were the case). Important point in this regard is that the absense of any direct accusation of Russia or “pro-Russian rebels” in the DSB report means that the Commission could not find (or fabricate) a single evidence which could be presented as a “prove” of Russian involvement. The international investigation under ICC should be initiated by Prosecutor of ICC (article 15). To open the case, a State Party of the ICC should refer a situation to him (article 14). In this particular situation Ukraine is not a Party of ICC (Rome Statute not ratified by Ukraine yet), so the options on the table are Netherlands (ICC State Party) giving the formal request to ICC or Ukraine accepting an Act of recognition of ICC jurisdiction over MH17 incident (article 12, paragraph 3) and thus referring to the Prosecutor. Quite noteworthy is that during 2014-2015 the incumbent Kiev’s authorities have already twice (!) accepted acts of recognition of ICC jurisdiction over “crimes against humanity, committed by senior officials of the state… within the period Nov 21, 2013 – Febr 22, 2014” (February 25, 2014) and over “crimes against humanity and war crimes committed by senior officials of the Russian Federation and leaders of terrorist organization DNR and LNR” (February 4, 2015). (The latter does not contain a single reference to MH17 shootdown, by the way.) So what impedes Ukrainians, in case they feel themselves absolutely clean in the situation around MH17, to adopt another act of recognition? We have strong confidence that they perfectly know that any serious international criminal investigation would inevitably lead to the real perpetrator of this crime: Ukrainian Air Defense and current regime in Kiev. So only one chance for justice for the victims of MH17 is left: Malaysia, being a non-Party of ICC as well, adopts the same Act of recognition of ICC jurisdiction over MH17 case and secures the investigation till the final verdict.